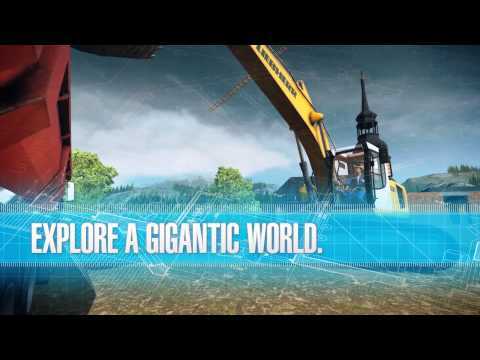 Construction Simulator 2015 - Buy and download the game here! In Construction Simulator 2015, you take the controls of 15 realistic construction machines made by Liebherr, Still, and MAN with high-quality 3D graphics. Excavate the foundation of a house with realistic machines, pour concrete into the wall panels of a factory with an enormous concrete pump, or test the steadiness of your hands by placing gigantic roof trusses with a mobile crane. Thanks to the realistic controls, you can steer an with two joysticks using SAE controls and feel as if you are working on a real construction site. You can of course also share your mods with the wider community of fans through Steamworks or on fan sites. This way, a huge community of players can access an endless and varied supply of user-created content. The barrier to entry into the world of modding is not particularly high – all you really need is a 3D graphics program like 3ds max or Maya as well as the free version of Unity3D.